Ray Lloyd Kimbrough was an individual of many talents and capabilities. Throughout a long and fruitful life he served the Church of God (Holiness) as pastor, missionary, administrator, editor and writer, and educator. The son of James T. and Letha Kimbrough, he was born on November 30, 1889, at Thomas Hill, Missouri. The little village is located on Missouri Highway C a few miles south of College Mound, Missouri. Both places are a few miles northwest of Moberly, Missouri. Presumably, the spiritual influences on the developing youth were from the home and the church and college associations of College Mound. The school at College Mound, McGee Holiness College and Ministerial Training Institute, was operated under the auspices of the Church of God. The paper, The Good Way, was edited by John P. Brooks and, in effect, had become the official organ of the Church of God. Brother Kimbrough was converted at the age of twelve. His pastor, Brother Moses Points, who came to the country church once a month, asked for response by those interested in prayer. Three hands were raised, but the preacher saw only two and prayed for those two people who wanted to be saved. Feeling that he had not been seen, Ray Kimbrough went home after the meeting and, out in the rail-fence corner down in the orchard, he found a place of prayer and was saved. Not long after, “in the same fence corner or one nearby” he sought the experience of entire sanctification. The obtaining of this experience was the determining factor in making him the man he was. At age fifteen he was called to preach, and soon began his work of preparation and preaching. In 1914, at the age of 24, he received the A. B. degree in theology from the Meridian Male College in Meridian, Mississippi. I do not have information about the classes that he took, although I have every reason to believe that they were of a wide liberal arts and theological range and of a very high quality. During my senior year, 1942-43, at The Kansas City College and Bible School, Bro. Kimbrough was the Vice- president and Dean of the College. He also taught classes. They included, among others, advanced Spanish and astronomy. But the class that will always remain memorable for me is his class in the Hebrew language. Four of us students expressed a desire to study Hebrew. We had learned that Bro. Kimbrough had studied Hebrew at Meridian Male College. We asked him if he would be willing to conduct a class in the language. He readily consented. To anyone who has studied Hebrew and been away from it for several years it soon becomes evident that this is no light undertaking. In those college days he had used the two books, Elements of Hebrew (New York: Scribner’s, 1890) and Introductory Hebrew Method and Manual (New York: Scribner’s, 1892), by William Rainey Harper. They were the premier Hebrew texts of that era, and, I should judge, not surpassed by subsequent texts. Harper, who later became the first president of The University of Chicago, was Professor of Semetic Languages at Yale University. So Bro. Kimbrough went to The Kansas City Book Exchange at 800 Grand and bought four sets. That a college professor would get books for the students is now-a-days quite unimaginable, to say the least! But those were the days of “the old paths.” I received my set on September 15, 1942. Each book cost $1.25. I cannot at this point refrain from mentioning that we students often went to the book exchange, and, after rummaging through the collection, purchased theological works—classics and now well-nigh unobtainable—at an embarrassingly modest cost. For example, I have a leather-bound, 1850, two-volume set of Richard Watson’s Theological Institutes (the first Wesleyan theology), for which I paid a total cost of $1.00. Bro. Kimbrough’s father was president of the “Sovereignty” school, the Holiness Collegiate Institute, from 1906 to 1919. It was located at Clarence, Missouri. It is quite evident that he deplored the division within the church between the two factions: the “Supremacy” group and the “Sovereignty” group. In February of 1908 he was a member of a delegation of “Sovereignty” people that met with a “Supremacy” delegation to consider reunification. However, the attempt to heal the breach did not succeed. In the following year, 1909, J. T. Kimbrough suggested that a layman’s convention be convened as a means of uniting the two groups. But nothing came of this suggestion. At the “Sovereignty” convention of 1912, he read a letter from the “Supremacy” group expressing the desirability of reunification. But, again, the desired result was not forthcoming. During this period Ray L. Kimbrough was a youth in his late teens and early twenties. In 1912, presumably, he was in attendance at Meridian Male College in Mississippi. But he certainly would have been aware of and interested in the early moves for reunification. It can be deduced, therefore, that his father’s efforts significantly predisposed the son to think in terms of reunification. It is also interesting to note that one of the Supremacy members of the 1908 meeting of the joint-delegation was J. F. Watkins, the father of A. C. Watkins. It would be left for the sons to accomplish, in concert with others, what the fathers failed to realize, despite their intentions and efforts. And it might also be noted that the two sons received their higher education in institutions not associated with the church in which they held membership. It is quite possible that this gave the sons the objectivity and distance that were essential to any successful effort toward reunification. The Life and labors of Sister Ida Kimbrough will not soon be forgotten. She was self-sacrificing and untiring in her labor of love. She denied herself many times that others might benefit. Since we have labored together for nearly thirty years I have had the opportunity to make many observations that reveal the finer qualities of her Christian character. She possessed enough of wit and humor which, with her godliness and piety, made her ministry both interesting and edifying. At the time of this writing, I do not have information about Bro. Kimbrough’s life and activity during the few years following his graduation in 1914. David Mauck mentions that Kimbrough was instrumental in forming the Foreign Mission Board, and gives the date as 1917. Presumably, he was then with the “Sovereignty” group. In October of 1921 he was elected editor of The Church Advocate and Holiness Banner, which was published at Fort Scott, Kansas. May grace, mercy, peace and love be multiplied unto every reader of the BANNER. Perhaps this announcement comes as a glad surprise to many of our readers; possibly, as a sad disappointment to some others. But, whether pleased or displeased, let us all remember that the cause of true Holiness and the doctrine of the One New Testament church is to be propagated and set forth if we are to be true to the trust given us as a people. God is expecting us to lift up the standard of Holiness unto the Lord both by word of mouth, by pen, and by holy living. Let us stand by each other doing our best to make the paper a blessing to all. To attain the greatest possible success, all should pray, all preachers and workers should secure us as many new subscribers as possible; all subscribers should renew promptly, keep up the Emergency Fund as heretofore, and last but not least by any means, let those who are gifted contribute good, timely articles, regularly, as well as reports of meetings, testimonies, and exhortations. Now, if it should happen that our judgment should differ from yours, pray for us until you get blessed before you censure us; then, while blessed to the shouting point, criticize us if you feel like it. Our dear Bro. Goodrick, who has edited the paper for seven years, has kindly volunteered to keep every thing going at the office until we can make necessary arrangements and get moved, which we will do as quickly as possible. The God of Abraham, Isaac, and Israel is our God. He who graciously delivered his people out of the hand of the enemy, fed them when distressed, and led them into the promised inheritance, has promised to withhold no good thing from us. Let us keep in mind the exhortation of Paul, “Let all things be done unto edifying” (1 Cor. 14:26). Brethren, friends, we are expecting you to stand by us. We believe you will. Amen. We feel that it might be profitable to give our readers facts in regard to the steps that have been taken in bringing the two bodies of holiness people (the Unity and the Independent people) together. We who were appointed unto this business have endeavored to follow the leadings of the Holy Spirit, and in so doing we have had no intention of sacrificing truth on any line, but rather have tried to measure up to God’s standard—the Bible. Neither have we done anything in secret or under cover, but as committees we have only done what we were directed to do by the conventions and then we submitted our recommendations, which seemed satisfactory with most all people in both movements . . . . Hence no one should allow himself to believe that a few men composing the committees have taken things into their own hands—we have only carried out the counsel of the conventions and the order of the churches. And that the Lord hath been well pleased is manifest to all. He served in this capacity for but a few months, until the “Sovereignty” and “Supremacy” groups united in October, 1922. 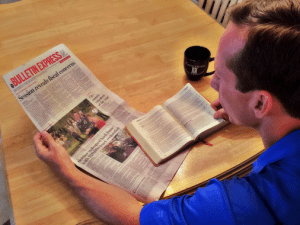 The two church papers, The Church Advocate and Holiness Banner, and The Church Herald, were merged into The Church Herald and Holiness Banner, published at Fort Scott. Ray L. Kimbrough and George H. Smith were joint editors until October of 1928, when Kimbrough became the sole editor. He served as editor until October of 1931.
of Ray Lloyd and Ida Kimbrough. Born of deeply pious parents, reared in Christian homes, surrounded by an holy influence where the Bible was read and prayer offered each morning and evening, it is only natural and probable that we should give our hearts to God, which we did when quite young. Soon after conversion, knowing the teaching of the Holy Scriptures pertaining to holiness as set forth in the following passages and others (Hebrews 12:24; 1 Thess. 4:3, 4:7, 5:23), we sought and obtained the experience of entire sanctification. Our call to the work of the ministry was a call for preparation, and immediately we began such preparation by attending the Bible School and College. I took a Bible course and Bro. Kimbrough took the A.B. and B.D. degrees. Our lives having been thrown together in college life for some time, we felt divinely led to embark on the great sea of life together. Accordingly we set sail at 6 p.m., June 2, 1912, the ceremony being said at the Sanner home by Elder J. A. Sneed. The following Sunday found us in Cuba, Alabama entering the work which God had assigned unto us. We found much to be done for the Master among this loving generous southern people who stole into our hearts as we labored among them, bearing their burdens and sharing their sorrows and joys. Our three children were born in this southern clime. Our work extended from the home of luxury to the humble cabin with its dirt floor. Our evangelistic work extended over fourteen states. After ten years of labor in this southern field where many were rescued from sin, many fainting fallen ones encouraged and the work of God strengthened, we were called to Fort Scott, Kansas, to edit the official paper of the Church of God, in which capacity we are now serving.
. . . this is a remedy for the dance and other sinful pleasures. And so the world goes on in its mad race for fun and frolic, and at the same time omitting the very thing that is more needed than anything else, the blood of Jesus and real vital godliness. That is the only remedy for evil that has ever been offered to this world by the mightiest and best giver of all good, and nothing can ever take its place. But the devil is willing for any sort of substitute, just so folks miss the right thing. It is evident that Brother Kimbrough regarded his editorship as a teaching ministry. His articles a exhibit an informed and substantive scholarship. He wrote articles dealing with the Second Coming. The June 8, 1922, issue of the Church Herald and Holiness Banner, carries two articles, an editorial entitled “The Coming of the Lord,” and an article, “Greatly Agitated.” The article is a defense of premillennialism, which Bro. Kimbrough associates with the doctrine of holiness. Two articles on the subject of the Judgment appeared in 1929. They argued that there are four distinct judgments: the redeeming judgment of the Cross, the judgment of rewards for the faithful, the judgment of the nations, and the “Great White Throne” judgment. An editorial in the April 6, 1922, issue, “Baptism of the Holy Ghost,” points up the need for regenerated people to be sanctified wholly. Beyond sanctification, there is no further, third, experience. After waiting upon God in prayer we felt led of the Holy Ghost to write on this subject. We recognize that it is a great subject and we are fully aware that we shall not be able to bring out all the truth pertaining to it, but shall be able by the help of the Holy Spirit, to bring before our hearts some portions of the truth on this subject. We also recognize the great need of getting this truth to the people. Perhaps it is true that the older saints in our work may not specially need this truth, having accepted and embraced it many years ago, but we feel sure they will enjoy it, while many of the younger ones are in great need of it. It seems that we have not had as much preaching and teaching on this subject of late years as formerly. Consequently there are many new converts who are not so well informed as they might be. We come now to study the Church of God—its name, its builder, the kind of material, its officers, its organization, its government, its purpose, its power, and whatever we may find in the Bible pertaining to it as the Holy Ghost may direct. The years following his editorship of the paper were likewise busy years. In 1932-33 he was the head of a delegation to Jamaica and the Cayman Islands, the purpose of which was to establish missionary activity in those places. He became a member of the “The Foundation Corporation of the Churches of God (Holiness),” when that Board was created in 1934. He was also an original member of the Credentials Committee, established that year. He was also a member of the Board of Publication. A Board of Education was established in 1946, to which Bro. Kimbrough was, with others, elected. When The Kansas City College and Bible School was founded in 1938, Bro. Kimbrough was elected Vice-president. He served in this capacity until 1944. In the 1942-43 catalog he is listed as Vice-president and Dean. He is also listed as instructor of English, Literature, and Foreign Languages. It is in this capacity that I best knew him. Ida, his wife, had died earlier in 1942. Brother Kimbrough came to live and work in the college in the fall of that year. I was then a senior in the college. This was the year of his great class in Hebrew, which I have described in some detail above. In addition to his teaching, he preached on Sundays in various churches in the area. At that time I was a student pastor of the church in the Diamond community, near Fort Scott, Kansas. There were times when Bro. Kimbrough would drive to a nearby church for Sunday services, and he would take me with him in his car. These were occasions, particularly during the night-ride to Overland Park following the evening services, when we would discuss various relevant subjects and issues. It was the dark days of the Second World War, when the tide against Nazi Germany had not yet decisively turned. In my diary entrance of Sunday, November 29, 1942, I recorded one such occasion. After the service I had stopped in at Paul McGehee’s home, where Bro. Kimbrough met me. As we drove to Overland Park, we listened to a speech given by Prime Minister Churchill. He was able to give it, he said, because the tide was beginning to turn and he felt justified in so declaring this to the world. The speech was in celebration of the victory at Alamein: “Two Sundays ago all the bells rang to celebrate the victory of our desert army at Alamein . . . .” [That speech can be heard on the Web “Sounds of History.”] I’m confident that we discussed the war situation, although I don’t remember the details of our conversation that evening. In the early summer of 1943, Ray L. Kimbrough and Mary Kiplinger were married. Mary writes of their wedding in her autobiography, published in 1967 by The Herald and Banner Press. The book also describes in some detail the events of her husband’s life until the time of her death in 1968. One son, James Lloyd Kimbrough, was born. Bro. Kimbrough was the pastor of several churches during this time of his life. In 1947 he was the first representative to the British Virgin Islands and established the church at Virgin Gorda. In 1950 he again served as Dean of the College and Instructor at KCCBS. Later he was Field Secretary for the Missionary Board, having moved to Fort Scott, Kansas. 1953-55 saw him as Resident Missionary Representative in Jamaica, West Indies. Ray L. Kimbrough died on March 25, 1983, in Columbia, Missouri. He is buried in Fort Scott, Kansas, awaiting with those whom he most loved in this life the Resurrection of which he so often wrote. He lived a long and significant life — a life lived in the service of his Lord whom he loved with the single intention of a pure heart. To those who knew him he remains secure in their innermost memory. Acknowledgments: I am indebted to Charles E. Jones for Bro. Kimbrough’s graduation picture; to Gayle Woods and Elaine Simpson for copies of Banner articles; to Michael Kimbrough and his daughter, Sandy Berkel, for pictures and written materials; and to James Lloyd Kimbrough for information relative to his father’s last years.